Yup... I have a few people to thank on that one... including you and Jimmy! How come I get the feeling that Lizzie Borden 2 wouldn't be as good as Black Christmas? Terror has a new name: "Fear Itself"! A 13-episode suspence and horror anthology series, "Fear Itself" takes horror to shocking new heights with its mix of mind-bending stories, spine-tingling chills, and top Hollywood talent including acclaimed directors John Landis (An American Werewolf in London), Darren Lynn Bousman (Saw II, Saw III and Saw IV) and Ronnie Yu (Bride of Chucky); actors Brandon Routh (Superman Returns), Shiri Appleby (Charlie Wilson's War), Elizabeth Moss ("Mad Men"), Cynthia Watros ("Lost"), Eric Roberts ("Heroes") and John Billingsley ("Star Trek: Enterprise"); and writers Joe Gangemi (Wind Chill, the novel "Inamorata"), Steve Niles (30 Days of Night) and Dan Knauf ("Carnivale," "Supernatural"). Rookie cop Danny Bannerman spends the night in an isolated precinct guarding a serial killer who eats his victims and is intent on making Danny his next "meal." While on a stakeout in a haunted house, a private eye hired by a mysterious woman is forced to confront the demons of his past. 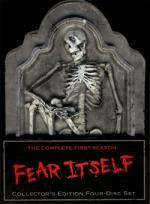 This is a horror anthology series that I watched some episodes of when it originally aired. At that time I found the episodes to be very uneven. You got some really good episodes... and some that I would say is just fair. The first thing I noticed about this DVD set is the packaging. Sure... the tombstone packaging looks cool... but it definitely don't look to safe for the DVDs. The Tombstone is a digipak... with 2 discs on each side... overlapping discs. And if that isn't bad enough they are duel sided discs! Why would they even use duel sided disc? There is only 4 episodes per disc... which could easily fit on 1 side of a disc... but they decide to put only 2 episodes on each side of a disc. The next thing I noticed is that the episodes are not in the order that they aired. Sure only 8 of the 13 episodes actually aired on TV... but I think they should have put those 8 first... in order they aired and then did the final 5 in order they were made. This is one of the episodes I actually missed when it was on TV. It is the 4th episode to air. I really wish I seen this one on TV as it may have given me some more hope for the series... as I really liked this one a lot. Sure there was some problems with it.... some good sized plot holes and such. But it was entertaining... and kept my interest throughout the episode. This is one of the few that I have seen before. Spooked is the second one to air... so this one is actually in the right spot in the set. It is one of the good episodes... I enjoyed it quite a bit. Though I will say it was a little on the weird side. But it has a good ghost story atmosphere to it. Definitely worth watching. 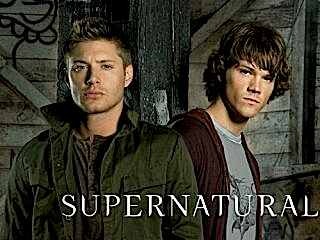 Sam thinks about giving up hunting; Dean and Castiel team up to find Raphael. Sam wants to rejoin Dean om tje nayy;e pf tje apocalypse, but Dean thinks they are better apart. A good episode... enjoyed it quite a bit. Not only bring the story along nicely... there was a few laughs in this one as Dean had some great one liners. At the end of the last episode... when they showed the preview for this one I wasn't sure how I would feel about it. It seemed like Dean was going to take a jump forward in time for about 5 years. Don't get me wrong... I don't mind time travel stories... I actually usually enjoy them. But for a series such as this I think it has to be done in the right way... and it was as I enjoyed every minute of it. Enjoyed this one even more then the last. Though they did play it more seriously... didn't give Dean any good one liners this time. 'The Lost Boys' reshapes vampire tradition, deftly mixing heart-pounding terror, rib-tickling laughs and a body-gyrating rock soundtrack. Under Joel Schumacher's direction, a marvelous cast - Jason Patric, Jami Gertz, Kiefer Sutherland, Corey Feldman, Corey Haim, Barnard Hughes and Edward Herrmann - stakes you to gleefully ghoulish entertainment. Judith (Markie Post. There's Something About Mary) notices some very creepy things are happening around town. She and the town's sheriff make a chilling discovery, the town's teens are disappearing. When they recover they are suffering from amnesia. Judith is even more troubled when her daughter, Katie (Candace Cameron, Full House), is missing. When she returns and begins acting strangely, it becomes evident alien powers have taken over the town. Judith must stand up to her fears and rid the town of the aliens that have come to claim her daughter. This is one of then movies I bought blind this month. From what I understand this is a TV Movie that I believe originally aired on Lifetime. I bought it not only because the plot sounded interesting... but I used to watch Markie Post in Night Court and Candace Cameron in Full House. Besides... the DVD was right cheap. While this really wasn't what I was expecting... I did enjoy this movie. OK Everyone... I am very sad to say it looks like this is the end of my marathon. Real life gave me one hell of a smack in the face this month. I enjoyed what I could do... even though it was next to nothing. But hey... I will be around... and will be saying hi everyone!